Women are regarded in the insurance industry as "safer" drivers and less likely to be in a road crash. Even though all drivers need to be alert and cautious, female drivers unfortunately have to be even more vigilant in order to avoid falling prey to criminal acts such as hijacking, intimidation, sexual assault or worse. Female drivers are still regarded as more vulnerable by most criminals. Drivers should always consider threats and possible worst case scenarios – and plan to avoid as many of these as possible. The vehicle handbook will provide important information on specification of oil, antifreeze to use if you have to top-up etc. Check tyre condition and pressure regularly. Change damaged or excessively worn tyres and don't forget to check the spare. Plan your route if the journey is unfamiliar and keep to well-lit main roads. Don't drive after dark into areas you don't know, if you can avoid it. It is easy to get lost, and become a target for criminal activity. Always be ready in the event of a delay on the road - Ensure your cellular phone is fully charged - and invest in a car charger if you don't already have one. Keep your valuables - laptop, handbag, cellphones - out of sight. 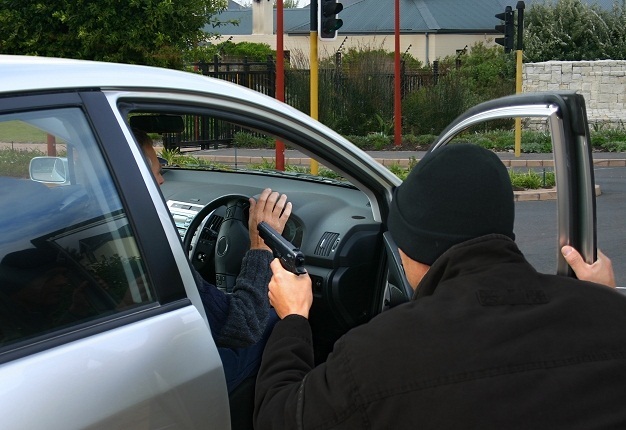 Even though there has been success in reducing hijackings, theft from vehicles in SA has increased! Should you wish to interact with someone alongside the vehicle open the window only a few centimetres to talk. Beware of anyone who signals that there is something wrong with your car, unless you know that they are right and it is dangerous to drive on. Sound the hooter in potentially dangerous situations. Unfortunately, nobody can predict every emergency situation - and there is often little we can do to avoid them. What should we do during an emergency? It helps to have an emergency kit, snacks and water with you in the vehicle at all times. A coat, sensible shoes, blanket, torch, money and cellphone may well be the best items to provide comfort in an emergency situation. Should your vehicle break down, pull over, turn on the hazard lights and call for emergency assistance. If someone tries to get into your car, attract attention by sounding your hooter. If you have a flat tyre in a dark or dangerous location, drive slowly to the nearest service station or public place. Even if you ruin the tyre, you will not have risked your life. Do not assume that an unmarked vehicle with flashing lights is a police car. Keep on driving slowly until you can pull over in a well-lit area such as a petrol station. Park as close as you can to the entrance of the kiosk or a fuel pump and hoot to attract attention. Should the vehicle following you be genuine, police in it will approach you - When they do, open the window just enough to speak to them and ask to see their police IDs. WHAT IF YOU'RE BEING FOLLOWED? Drive to the nearest police station - but if it is too far or you don't know where it is, drive to the nearest petrol station or convenience centre. In an emergency there is indeed strength in numbers! Note which floor and area you have parked in and have your keys ready when you return. Try to park so that you will approach the driver's side of the car when you return. You won't be surprised by someone who is crouching close to the door. Wait until you're close to the car before unlocking it and if the car design allows it, unlock the driver's door only. Avoid conversations on the cellphone as you return to the car as this will only distract you. Do not fiddle with your handbag or shopping bags and don't lean too far into the boot. Some security experts even advise women with long hair to tie it back for a clearer, all-round vision.